Maryland’s Mickey Kunkle straddles the worlds of fiber and polymer in her jewelry. 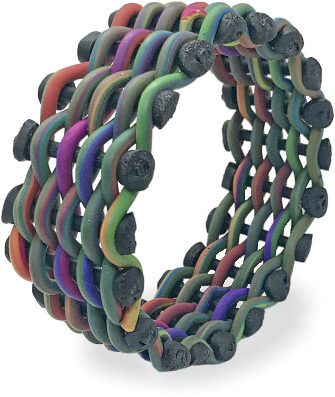 At Clayathon in New Jersey, Mickey was working on designing a woven polymer bracelet using a kind of loom she made by drilling holes in a round base. It’s a hybrid of fiber and polymer influences. 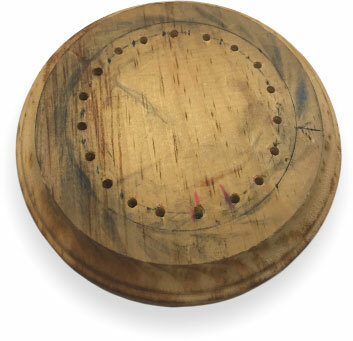 Mickey extruded round pegs that she cured and inserted into the holes in the base. She then extruded long strings to weave around the pegs to form a bracelet. Her prototype is strong and colorful and wearable. She’s still in the “Whatify” stage. In her gallery video, Mickey explains her struggles as an artist and how she has learned to combine her talents to suit herself. Can’t decide between your favorite artforms? Maybe you don’t have to. This was a very timely post for me as I was just struggling with returning to some of my previous craft mediums. I think many artistic people do have the urge to try out others means of expression but not everyone gets hooked! Thank you for showing this great example of combining different ideas to come up with a fresh, new idea.